UFC 206 will be held later today at the Air Canada Centre in Toronto with the main card being broadcast via pay-per-view event. In the UFC 206 main event Max Holloway and Anthony Pettis were to compete for the UFC interim featherweight title. 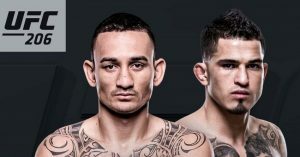 Yesterday Pettis came in at a 148 pounds, thus he cannot win the title, however it is still up for grabs for Holloway. Pettis has been fined 20 percent of his purse, also his Reebok sponsorship pay drops from $30,000 to $15,000. This card was insane to say the least. Probably one of the best of the year. 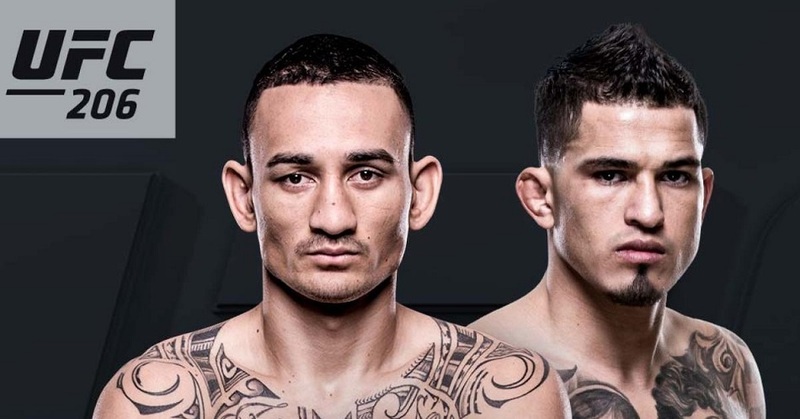 Max ‘Blessed’ Holloway defeated Anthony ‘Showtime’ Pettis via third round TKO to claim the interim title. Holloway then proceeded to call out Jose Aldo for the UFC 208 Brooklyn card. Also yesterday both Rustam Khabilov and Valerie Letourneau missed weight and both will be fined 20 percent of their purses. 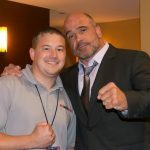 The co-main event was an MMA fan’s dream come true as strikes Matt Brown and Donald Cerrone finally met face to face inside the octagon at welterweight. If head kick knock outs are not your thing, this fight is not for you. Everyone knew these guys were going to go straight at each other, and that is exactly what happened. There were heart stopping moments when you didn’t know if the next punch was going to be the final one. And then…. just like that, in the third and final round, Cowboy knocked Brown out with a head kick. Unbelievable. Dooho Choi vs. Cub Swanson was a heck of scrap. These two guys went back and forth landing hard, heavy shots, both putting one another in danger on multiple occasions. This fight was unbelievable from bell to bell and if social media is any indication it could be a Fight of the Year candidate. Swanson won via unanimous decision but the crowd indicated that Choi was not a loser in the effort. Everyone was on their feet cheering for both competitors. Tim Kennedy returned to the UFC octagon for the first time in two years, going up against Ultimate Fighter winner Kelvin Gastelum who is not allowed to fight at 170 pounds anymore while employed by the UFC. After several failed weight cuts and missing his UFC 205 bouts against Donald Cerrone due to weight issues, Gastelum comes in at 185 pounds against Kennedy. Gastelum looked fantastic on the feet, lighting Kennedy up with every chance he got. The TUF winner ended up getting a third round TKO over Kennedy and the question now is: Is Gastelum better off not cutting weight and being the smaller guy at 185? Emil Meek defeated Jordan Mein via unanimous decision to open up the main card on pay-per-view. It was Meek’s first performance in the UFC. Viviane Pereira came into the UFC undefeated at 11-0 tonight going up against former title contender Valerie Letourneau who as mentioned previously missed weight yesterday and offered up part of her pay to the newcomer. The rookie came in and got the job done winning a close split decision. Lando Vanatta turned heads, literally, when he knocked out John Makdessi little more than a minute into the featured UFC Fight Pass preliminary bout with John Makdessi.